I treated myself on Mother's Day to a bit of sewing time in the afternoon, away from the custom quilt orders. I had purchased a charm pack of "California Girl" by Fig Tree Quilts and I wanted to make the 23 1/2 inch square table topper from the Summer 2012 of Quilts and More. It was fun and quick to put together. I finished the hand-quilting last night. There is something about the shade of blue in this fabric collection. It's just dreamy. See the blue with the pink flower and little white polka-dots? It is my favorite. I also love a pieced border. My self-imposed, fabric lockdown for the year is a bit challenging at times. I know that fabric lines don't last long. Purchasing a charm pack gave me enough fabric and hardly any fabric left over. I am pleased to be working my way through my stash. On another note, do any of you know what this little cage is for? It came from a flea market and the top slides up a metal handle. I thought at first it was a bug catcher, but the bars are set too far apart for that. This one has me stumped! I really love how your little quilt turned out! I agree the blue with the little flowers is my favorite too! What a pretty little quilt! Is your cage a bird feeder?? I have a similar modern version that I fill with nuts! 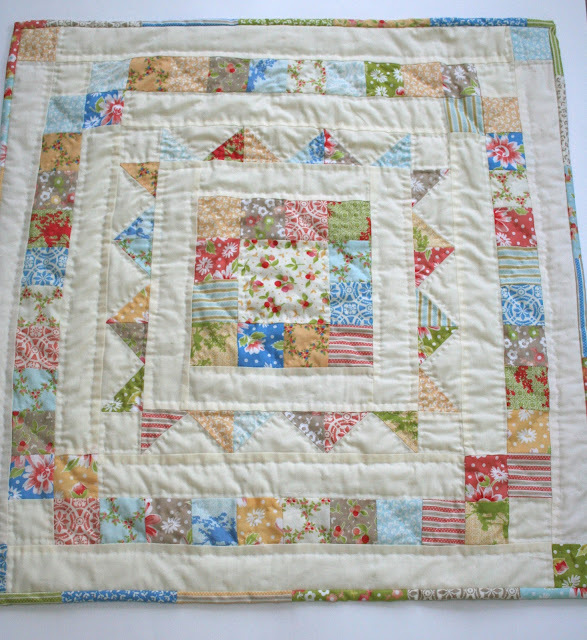 Love this wee quilt, so pretty and fresh! I have pinned it to my Quilt and Sew board for future reference, hope that is ok with you! I have a charm pack of CA Girl also. I agree that the operative word to describe your quilt is indeed "sweet"! I adore the muted colors and the vintage look. Wonderful table topper. California Girls is such a great line of fabric, you can't go wrong with it. What a good idea to just buy the charm pack of a new line. That way you get a little bit of it all. The quilt you picked was perfect to show off California Girl. It goes so well with your style. The best part it was small enough to get done in a reasonable amount of time. Love your quilt. Interesting cage...hmmm, I wonder what it is used for also. I read the comments to find out if anyone knew what the cage was for. 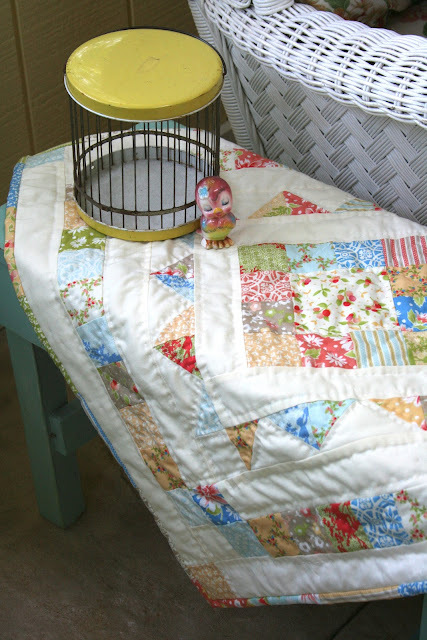 I dont know either, but it could be a bird feeder......I love the little quilt...it is so pretty. I love your little quilt and the colors are lovely! love your little table topper...that fabric line is dreamy! I wonder if that little cage is for a hermit crab? sure is cute! I have been trying to use the fabric I have and finish up projects too but that fabric line is so pretty. Blue fabric has always been my favorite, your little quilt is great and I love the hand quilting.